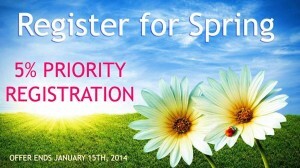 This is to notify you about our special offer of a Priority Registration for our upcoming Spring 2014 term. We are happy to offer our returning students from Fall 2013 a 5% Discount for Spring! This amazing offer ends on Wednesday, January 15th, 2014 for both locations. Online registrations is up on our website or please give us a call at the studio at: (905) 762-9393 or (905) 237-9278 to book your class. *Space is limited and filling up quickly!